Mood board: On Friday, the UK’s schoolchildren marched from schools to protest political inaction on climate change. Throughout fashion week, the environmentalist group Extinct Rebellion is peacefully protesting unsustainable practices used in the luxury industry. 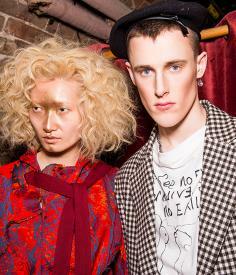 Vivienne Westwood is well versed in environmental issues and uses her label to bolster awareness on sociopolitical issues, from freedom of speech to fracking. Her A/W 2019 runway show, held at a resplendent church in Westminster’s St John Smith’s Square, was her most polemical to date. The catwalk show featured apocalyptic and impassioned spoken sermons on climate change, Brexit, corrupt governments and our spin into self-destruction. ‘Something has to happen now. If not, we’re all dead’ said the first mic’d-up male model who opened the show. It was a stirring start to a politically poignant and rousing event. Team work: Westwood’s show concept usurped the idea of the mute model, with some akin to political performance art. Hers stood proudly on stage delivering, at times, uncomfortable comments to the audience. ‘The world is bankrupt’ one stated. On the rousing roster? #MeToo activist actress Rose McGowan, John Sauven, executive director of Greenpeace UK, Fred Harrison, author and policy advisor and model, actress and activist Sara Stockbridge.